Thoroughly wash lentils under cold running water, then put in a pot with salted water and bring to a boil. Once boiling, reduce the heat and cook on low until soft, or about half an hour. Once cooked, drain lentils, give it another wash, and set aside to cool. Wash and dry tomatoes and cut into small pieces. Peel and slice onion. Wash and dry spinach leaves. Prepare mustard dressing: pour olive oil, white balsamic vinegar and lemon juice in a jar, add dijon mustard and salt and pepper to taste. Whisk until well blended and emulsified. Place lentils, tomatoes, onion and spinach in a salad bowl, dress with mustard dressing and combine well. 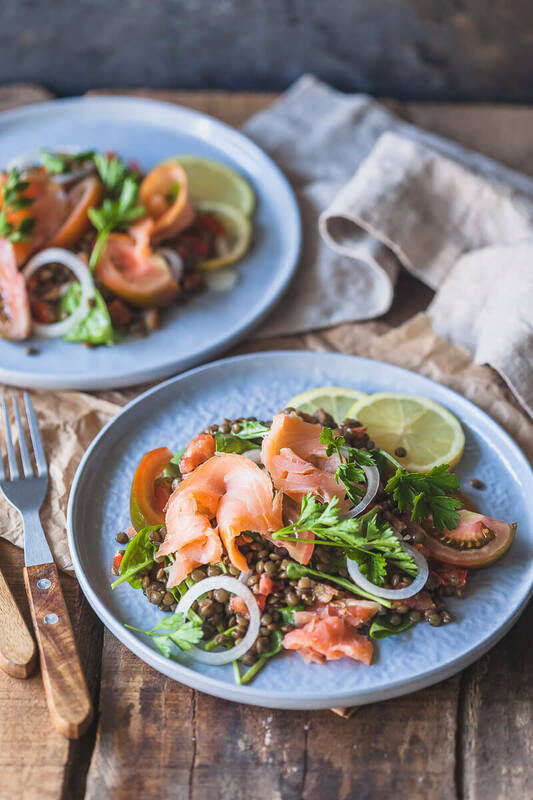 Place lentil salad on plated and top with pieces of smoked salmon. Serve.